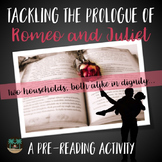 This activity allows students to familarize themselves with Shakespeare's language. 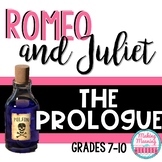 It asks for students to look up and define unfamilar words and rewrite the prologue in their own language. 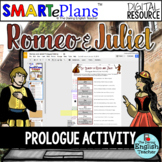 This activity helps students feel like they can understand what Shakespeare is saying. 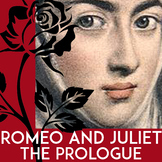 Students will break down the prologue of Romeo and Juliet into something they can understand. 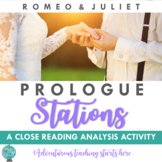 A lesson handout for the Prologue in Romeo & Juliet that includes a pre-reading guide/vocabulary, translation of the Prologue in Shakespeare's language, and post-reading questions/analysis. 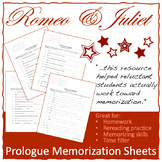 This guide introduces the prologue of Romeo and Juliet while teaching what a sonnet is and how to write one. "Two households both alike in dignity..." Huh?! 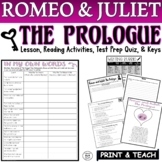 This chart focuses on the Romeo and Juliet prologue. 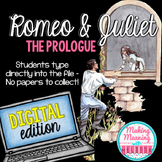 It helps students translate Shakespeare's language into modern day words that they can understand. Each line is numbered, and they take the phrase line by line. A key is included. 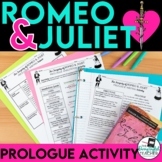 Students will annotate the prologue for understanding and write a summary about the sonnet. 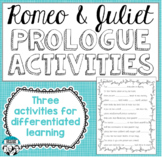 This is a great activity for low-level learners because of the hands-on analysis and graphic organizer for writing.